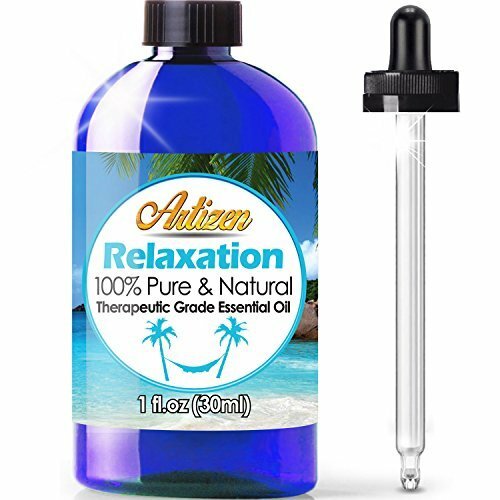 Artizen Relaxation Blend Essential Oil (100% PURE & NATURAL – UNDILUTED) Therapeutic Grade – Huge 1oz Bottle – Perfect for Aromatherapy, Relaxation, Skin Therapy & More! NOTE ON ESSENTIAL OILS: Essential Oils are CLEAR. Essential Oils have a thin, water-like consistency. Although we bottle our oils in colored glass bottles to protect them from UV light damage, the oils themselves are always clear in color. This is normal, all essential oils are clear. Also, although “Essential Oil” has the word “oil” in it, which can bring to mind a thicker substance more like, for example, olive oil, Essential Oils actually have a very thin consistency and are more like the consistency of water – they do not present as ‘oily’.